Ford Library has recently added over 30 new audiobook titles. To browse all of our audiobooks or to search for a specific title, you can visit our audiobook search page. Please feel free to send any comments or questions about our audiobooks to: reference-librarians@fuqua.duke.edu. Ford Library has recently subscribed to the following new database with access open to all Duke University Users. This online service will replace our print subscriptions to the above titles. No further print copies of the above will be added to our collection. Links to the SRDS Media Solutions Database are available on our Quick Links, Descriptive List, and Subject List database pages. Please feel free to send any comments or questions about this database to: reference-librarians@fuqua.duke.edu. 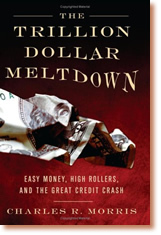 Morris, Charles R. The trillion dollar meltdown : easy money, high rollers, and the great credit crash. Public Affairs, 2008. Almost daily the Wall Street Journal reports on the deepening credit crisis. Today, the front page includes a depressing story about bad loans, excessive risk taking and the need for large capital infusions. A year ago, consumer spending was strong, the market for investment grade credit was growing and the S&P 500 jumped 9% in three months. What happened? According to financial writer, investment banker and lawyer Charles P. Morris, we are experiencing the result of a reckless financial environment — twenty five years of free and unregulated financial markets. In the Trillion Dollar Meltdown, Morris provides a brief history of financial markets beginning with the Reagan era. He also discusses financial instruments, why they were developed and how they now contribute to the problem of leverage in our economy — instruments such as CMOs, CSOs and SIVs. Krupp, Fred and Miriam Horn. Earth: The Sequel, the race to reinvent energy and stop global warming. Norton, 2008. In the 1980’s, author Fred Krupp of the Environmental Defense Fund proposed the world’s first cap and trade system to reduce the levels of acid rain. The cap and trade system placed a limit on sulfur dioxide, divided the total among polluters and allowed them to trade on the market. Companies learned they could make money by not emitting pollutants. Innovation was inspired throughout the market and within five years, emissions were 30% lower than the cap required by law. 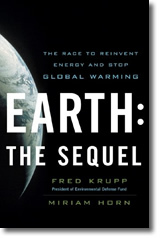 Krupp and Horn’s new book, Earth: the sequel, makes the case that the same market forces can be brought to bear on the problem of global warming. After making the case for a new cap and trade system, the authors discuss new and emerging energy technologies, including solar, biofuel and geothermal technologies. Most of the book is about the challenges and successes of the companies and people who make up the new clean energy industry — inventors and investors; visionaries and venture capitalists; entrepreneurs and their start-ups. This upbeat book is hopeful about the opportunities to reduce greenhouse emissions and resolve our environmental problems. © Reviewer: Meg Trauner & Ford Library – Fuqua School of Business. All rights reserved.